In 2008, the Telegraph sent some observers down to a Rabbitohs game at ANZ Stadium to check the attendances. The Telegraphs observers came up with a figure of 7,522 – the Rabbitohs later reported the crowd at 9,827. Crowd figures were then counted by the hosting club. 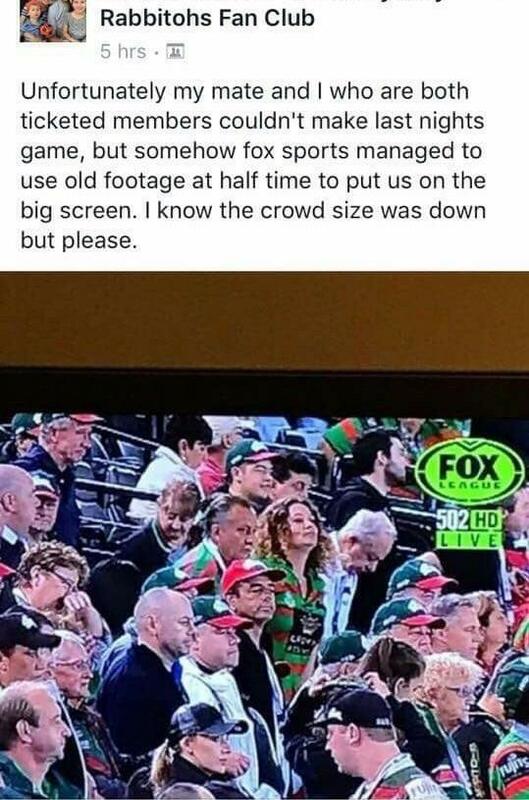 The Rabbitohs explained the crowd discrepancy away by saying that the Telegraph didnt have observers at unticketed gates for corporate areas, as well as stadium and club staff and officials. On June 1, 2011, the Sydney Morning Herald reported that Melbourne Storm CEO Ron Gauci claimed that crowd figures were regularly inflated, and that most clubs were doing it although the Storm werent doing it in 2011. On July 26th, 2011, The Queensland Sunday Mail reported that there was a discrepancy between the Gold Coast Titans reported figures for all 14 of its matches, and the figures posted in the Stadiums Queensland Annual Report. None of the Titans’ home crowds announced at 14 games matched the attendances printed in the annual report. Thirteen of Gold Coast’s 14 games featured inflated attendances. Five matches were overstated by 1500 or more attendees. The greatest discrepancy was an extra 2209 fans for the Titans’ home clash against Newcastle Knights in 2010. Brisbane Broncos‘ crowd figures at 11 games were identical to those in the annual report. Nine of North Queensland Cowboys‘ 12 games matched crowd figures in the report. Surprisingly, the club twice underquoted crowds. The Titans blamed faulty scanners at the ground. On April 7th, 2014, ACT Sports Minister Andrew Barr claimed that sports crowds in Canberra were exaggerated in the past. Raiders CEO Don Furner said the discrepancy was likely to be in the hundreds. In 2015, it was reported that crowd reporting had become more accurate with the installation of electronic counting machinesa at all NRL matches from 2012. The article claims that some crowd figures before that had been little more than educated guesses. In August 2017, Seven claimed that broadcasters had been caught using old vision of NRL crowds in order to to make attendances look bigger as the crowd crisis worsens in Sydney. This allegation appears to have originated from a single facebook post as far as I can tell. DeciderTV reported that the match in question was actually the Round 15 Friday Night clash between the South Sydney Rabbitohs and the Gold Coast Titans, and not the Round 22 Thursday night clash as reported by some media outlets. The footage in question was only on screen for seconds during one of the match breaks and Decidertv suggests it was laughable that anyone could have derived any kind of crowd collusion conclusion from that. A spokesperson for Fox Sports confirmed the production error telling DeciderTV “It was an error in judgment which we have addressed. This is not a regular practice of Fox Sports”. On September 28th, 2017, The Courier Mail reported that the NRL had been over stating its finals crowds, saying that a recorded 107,835 people walked through the gates of ANZ and Allianz Stadium in the previous three weeks – almost 15,000 fewer than the 123,030 reported by the NRL, with crowd numbers for several games inflated by as much as 5474 people (Cowboys vs Eels on September 16). August 21, 2017 – Fake crowds or Fake news? What actually happened in the NRL vision saga.